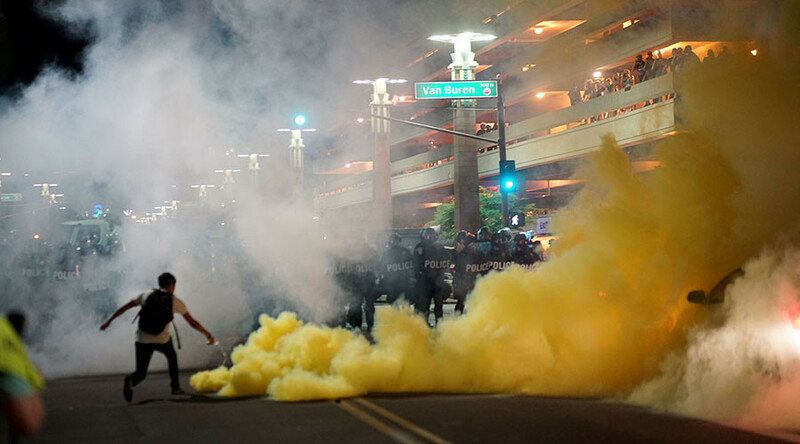 Phoenix, Arizona police have deployed tear gas against a group of protesters who gathered outside the venue for President Donald Trump’s rally. Some of the protesters reportedly threw objects at police. Hundreds of protesters were reportedly dispersed at the scene outside the downtown Phoenix Convention Center, where Trump spoke to thousands of supporters earlier. Ruptly news agency footage shows people shouting and running away from tear gas deployed by police. “People in the crowd have begun throwing rocks and bottles at police. They also dispersed some gas in the area,” Phoenix Police Department spokesman Sergeant Jonathan Howard said, as quoted by Reuters. “Police have responded with pepper balls and OC [oleoresin capsicum] spray in an attempt to disperse the crowd and stop the assaults,” Howard added. After police dispersed non-complying protesters, a small crowd with anti-Trump banners continued to demonstrate next to the police cordon. However, police in riot gear later approached the chanting protesters and pushed them away from the scene. There were some altercations as the thousands of Trump supporters were leaving the venue. One video shows several Trump supporters trying to leave the area in a vehicle being attacked by rioters. One man in the car was punched on the head while a female teenager sits behind him. On Tuesday evening, around 19,000 people attended Trump’s campaign-style rally at the downtown Phoenix Convention Center. The US leader lambasted the mainstream media for what he believes to be unfair coverage of his statements on the violence in Charlottesville, which left one person dead and 19 people injured. Outside the convention center, hundreds of anti-Trump protesters gathered.